UNIVERSITY of the Philippines got good games from its mix of rookies and veterans on Sunday, turning back Philippine Navy, 25-20, 24-26, 25-23, 25-15, in the consolation battle for third place in the Shakey’s V-League Reinforced Conference at The Arena in San Juan. Freshman Justine Dorog and team captain Kathy Bersola led the Lady Maroons with 17 points apiece. Another rookie, Maria Molde, added 16 points while veteran Nicole Tiamzon added 13. 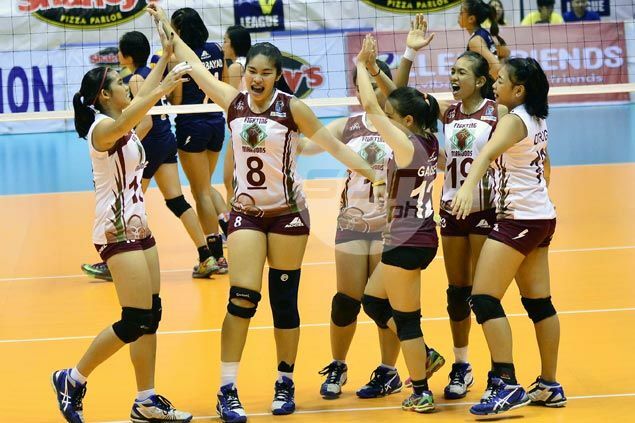 UP coach Gerry Yee said he was was pleased to see his young team mature in just a span of three months, which bodes well for the team entering the UAAP women's volleyball wars. Dorog moved UP to match point, 24-15, but it was the Lady Sailors who handed the Lady Maroons the victory after a costly error. Pau Soriano led the Lady Sailors with 15 points while Lilet Mabbayad had 13.